Marcus Brody was a friend of Henry and Indiana Jones. He appears in the Indiana Jones films Raiders of the lost ark (1981) and Indiana Jones and the Last Crusade (1989). Brody was the curator of the National Museum and a very good friend of Indy's. He helped Indy with arranging the expedition to find the Ark and later, the Holy Grail. During the search for the Holy Grail, Brody was kidnapped while he was in Iskenderun to commission Sallah's assistance in obtaining the Grail. The Nazis took the Grail Diary which helped them find the Grail Temple from him. Brody was later rescued by Indy, Sallah and Henry Jones Sr. Brody died in 1952 at the age of seventy-four. In the films, Brody was played by veteran British actor Denholm Elliott. 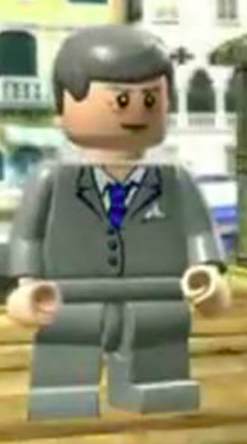 He can be found on the docks of Venice in LEGO Indiana Jones 2: The Adventure Continues. This page was last edited on 15 March 2016, at 18:45.